This week’s Secret Ingredient for Friday Foodie Fix is raisins. You might be thinking why did I chose this ingredient. Well I was eating a piece of Gluten-Free Irish Soda Bread I had just baked, thanks to the Gluten Free Goddess, and thinking about the many Mexican recipes I have been reading that use raisins and I thought that’s it. This coming week some of us will be celebrating St. Patty’s Day making Irish foods, some green some not. 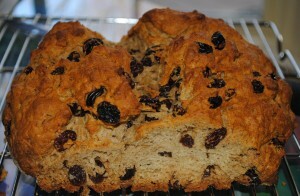 I will have to make another loaf of that soda bread since the first one is long gone. Maybe you have a recipe for that bread you would like to share. Back to our star ingredient raisins, those dried grapes we love to snack on. Raisins are made from Tompson seedless grapes and are either sun-dried or mechanically dried. I used to really love to eat the golden raisins but after what I’m about to share with you I’m not so sure I want them anymore. This is from my favorite book, The Deluxe Food Lover’s Companion (You own this book right? If you eat food you should own this book) “Golden raisins have been treated with sulphur dioxode (to prevent their color from darkening) and dried with artificial heat, thereby producing a moister, pumper product.” I’m just not a fan of chemicals in my foods. Here are some interesting facts, also from my favorite book. Freezing raisins makes them easier to chop. Currants can be substituted in recipes calling for chopped raisins. When adding raisins to a batter, first toss with some of the flour called for in the recipe, separating the pieces with your fingers as you do so. Keeps the fruit from sinking to the bottom of the batter. And this little gem, stored in brandy, rum or liqueur will add flavor when used in baked goods. Put in jar with screw-top lid and store at room temperature or in the refrigerator. Now that sounds like party raisins to me! What do you make with raisins? Are you baking, cooking or snacking? Share your recipes with Mr. Linky and in the comments section. Please make sure your recipes contain raisins and are your creations. Please link back to this post even if you are sharing an old recipe. I like to add a line like UPDATE: This recipe was shared on Friday Foodie Fix. That would work great. 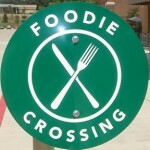 For more details check out our Friday Foodie Fix page. You can also find all of the past week’s ingredients. Next week’s Secret Ingredient is ………………… lamb! It's too good not to share, though. I still have people that make the recipe and e-mail me about it. It's full of good nutrition and perfect for any meal of the day. Thanks for hosting! Amy- Thank you for sharing. I remember this recipe. I'm thinking I may have even made it. I do love quinoa. Heather- My MIL used to soak hers in gin too for arthritis. She said it worked. She kept hers in a jar and the only place the alcohol went was into the raisins. Shirley- I have fond memories of bread pudding. I've not had it in years. I think the best I've ever eaten was at The Greenbrier. They made their own special cinnamon bread called Daily Bread and used that in the pudding. They also served it with the most amazing sauce. I think I still have the recipe in their cookbook somewhere. Might have to find it so I can see what was in that sauce. I think your bread pudding sounds wonderful. Thanks for sharing. that's a great tip about freezing raisins! Laura- Thank! What are you making with raisins? Hey! Thanks for sharing the info on golden raisins. I too love golden raisins and I just recently read up on them and discovered the sulfur dioxide and artificial heat used to produce them. Well, the things I don't know could fill an entire hard drive. (Ha, the computer things I don't know too well either, not even sure if that's the right thing.) We eat a LOT of raisins in our household, we usually just have them straight. And hey, you have really great blog…very helpful but funny too! Kay- I'm telling you that book is amazing and has tons of great info on food. We do love raisins in our house too. Thanks for the nice compliment and I'm glad you're having fun here. Life is too serious to always be serious.